Trial by water, a 1613 woodcut. Ecclesiastical laws condemning witchcraft in this country were first issued in the seventh century by Theodore, Archbishop of Canterbury, but the fear of witchcraft reached its peak in the 16th and 17th centuries with Kent second only to Essex in indictments. Witchcraft Acts were passed by the English Parliament under Henry VIII in 1542, Elizabeth I in 1562 and 1563 and James I in 1604. Contrary to popular belief English witches were not burned at the stake or tortured in the popular continental manner, as death at the stake was a fate reserved for traitors and heretics. 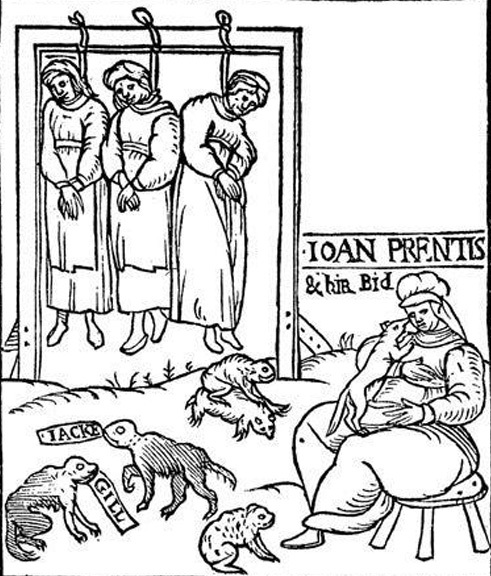 Under the Witchcraft Act of 1563 death by hanging was reserved for those found guilty of murder by sorcery. Once accused, pricking was the most common test as the belief was that all witches had a mark made by the Devil that was insensitive to pain and the discovery of such a spot was seen as a sign of witchcraft and was usually followed by ‘swimming’. To be “swum” the accused was taken to a stream or pond where they were stripped to their underclothes and had their big toes and thumbs tied together cross-wise before being thrown into the water for judgement with a rope tied around their waist to retrieve them after the ordeal was over. 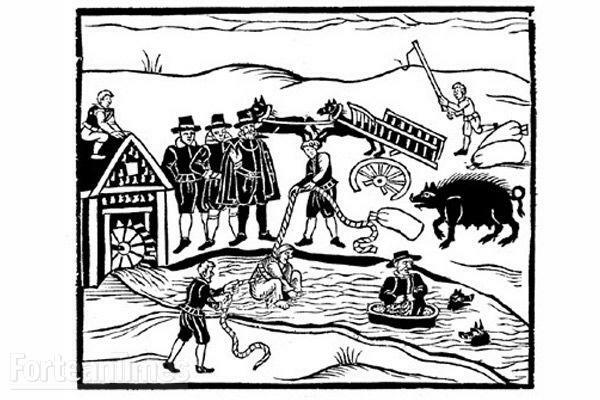 If during the “swimming” the accused drowned they were declared innocent but if they floated they were judged a witch and brought out for trial. If found guilty, as they inevitably were, the penalty was often hanging. In most cases personal malice was behind accusations of witchcraft, either for revenge or personal gain. Sandwich town records of 1631 tell of Goodwife Reynold being “swum for a witch” and subsequently hanged. In 1645 a similar fate befell Widow Drewin, here it was recorded that her “swimming” cost two shillings and that her goods were sold at auction after her execution. Ducking a witch to ascertain her guilt or innocence. Southern England and East Anglia became notorious in the mid-1600’s for witch-hunts by self-appointed fanatical Puritan “witch finders” such as Matthew Hopkins from Suffolk. Witch hunting in Kent reached a peak between 1640 and 1660, the period when Puritanism held sway after the overthrow of Charles I and before the restoration of Charles II. Kent assize records for the two decades show that 48 people were tried by the secular courts for witchcraft of whom 10 were men, 14 widows, and the remainder spinsters or married women. These were the lucky ones, they actually received a proper trial, many others were less fortunate. 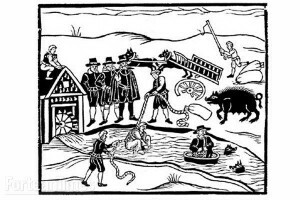 In the 1640’s Nell Garlinge, an probable ancestress of mine through my Garlinge paternal great-grandmother, was accused of being a witch and “swum” into the village pond at Coldred where she apparently drowned, so proving her innocence. During the period of turmoil during the 1640’s and 1650’s many parishes did not have a regular Anglican vicar to oversee the parishioners which allowed Puritan fundamentalists a great deal of influence over the everyday life of an ignorant and largely illiterate rural population enabling these extreme Puritan elements to implement their beliefs on the population as a whole. Accusations of witchcraft were one way of silencing any opposition to the fundamentalists as obviously any person opposing Puritan religious beliefs must be in league with the Devil and should therefore be punished accordingly. The death of Oliver Cromwell in 1658 and subsequent restoration of King Charles II in 1660 led to the speedy re-establishment of the authority of a generally more benign Church of England, but the persecution of “witches” by the law continued into the eighteenth century. Nonington did not escape the horrors of the “witch-hunts” of Puritan Kent. Sir Charles Iggleston in his book, “Those Superstitions”, published in 1932, tells the story of the untimely demise of Esther, a “witch” who lived and practiced her “craft” in Nonington. Esther, no surname known, was an elderly woman who scared ignorant inhabitants of Nonington into believing they had acted in a sacrilegious manner which led them into Satan’s clutches and caused their everyday misfortunes. Those suffering misfortune were told by Esther that the only way to avert such disaster was to consult her in her house and cross her palm with silver. The villagers eventually came to the conclusion that Esther herself was “influencing the Evil One” and they seized her from her house and carried her three miles to Adisham pond. The location of Esther’s house is unfortunately not recorded. Justice had indeed been done. Adisham pond, the place of “trial” for the wretched Esther by the Nonington mob, was only completely filled in in the 1960’s and now lies under the modern road junction of Adisham Street with the Canterbury road. There is no record in the Nonington parish burial records of any Esther or Ester being interred in St. Mary’s churchyard during the sixteenth and seventeenth centuries but she may have been buried in an unmarked grave in the churchyard with no record kept of the burial or grave because of her alleged crimes and the cause of her death. Those found guilty of witchcraft were often buried under heavy rocks or slabs to prevent them rising from the grave. Esther body may also have been buried in unconsecrated ground, again due to her alleged crimes and cause of death although Nonington suicides during this period were buried in the churchyard and their burials and causes of death listed in the records and not in unconsecrated ground as was the custom elsewhere. 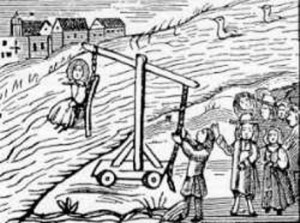 Nonington parish was well supplied with ponds at this time but it would appear that there was not one thought suitable by the inhabitants to administer “justice” to a witch. 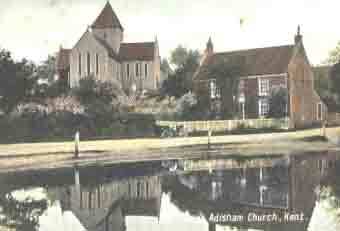 The large pond in the neighbouring parish of Adisham which was directly in front of the parish church was well known for being deep and dangerous and some 140 years after this awful event William Hasted wrote of Adisham and its pond: “The village, consisting of about ten houses, is situated, not very pleasantly, in a bottom, having a large and dangerous pond, through which the road leads, in the middle of it; near it, on a hill, stand the church and court lodge”. 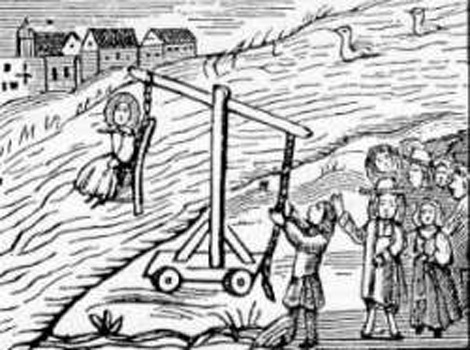 The last execution for witchcraft in Kent took place in 1685 but witch-hunting continued in East Kent. Hanna Baker of Elham was found guilty of “inchanting cattell” in 1703 and was punished with a years imprisonment with the additional punishment of being put in the Elham pillory on “the day after Ladyday, Midsummer, Michaelmas and Christmas for the space of six hours”. The Elizabethan laws against witchcraft were eventually superseded by the much more enlightened Witchcraft Act of 1735 which was a complete reversal of previous attitudes in that people could no longer be hanged for consorting with evil spirits, but a person who pretended to have the power to call up spirits, or foretell the future, or cast spells, or discover the whereabouts of stolen goods was to be punished as a vagrant and a trickster, and be subject to fines and imprisonment. However, deeply ingrained ignorant superstitious beliefs did not prevent the persecution, and sometimes the murder of, supposed witches in rural areas of the United Kingdom until well into the twentieth century. The murder of seventy-four years old Charles Walton in the village of Meon Hill in Warwickshire as late as 1945 was believed to have been, at least in part, caused by a belief in witchcraft. The last prosecution under the 1735 Act was of Jane Rebecca York in 1944, and the 1735 Act was superseded by the Fraudulent Mediums Act of 1951.